This is the story of a little girl named Fern who loved a little pig named Wilbur and of Wilbur's dear friend, Charlotte A. Cavatica, a beautiful large grey spider who lived with Wilbur in the barn. With the help of Templeton the rat, who never did anything for anybody unless there was something in it for him, and a wonderfully clever plan of her own, Charlotte saved the life of Wilbur, who by this time had grown up to be quite a pig. Published over fifty years ago, with original illustrations by Garth Williams, "Charlotte's Web" has become an all-time favourite children's story. Since its publication in 1952, "Charlotte's Web has become a beloved classic! Always a favorite for family sharing, the audio, lovingly read by the author himself, will now be available in this special commemorative CD edition, re-mastered with a bonus audio track. 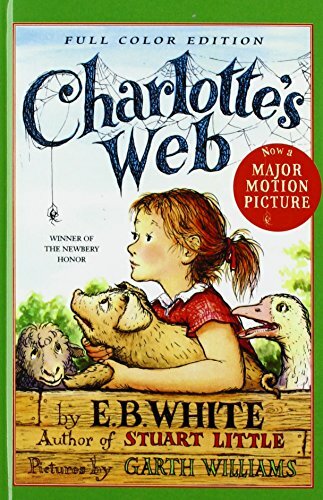 The "Charlotte's Web 50th Anniversary CD Edition will be a treasured keepsake for the entire family.